This is certainly a pretty basket made by Hull Pottery. It is marked USA 84. Soft yellow colors with soft pink pansies, and green tint to the leaves. On the back is a butterfly, and on the handle a pink bow. Measures 6 3/4" tall and has no damages or repairs. Shiny glaze finish. 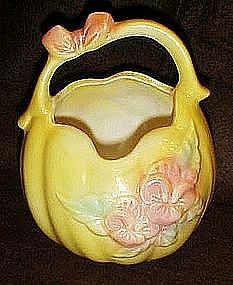 This is called Sunglow by Hull pottery.